This may come as a surprise, but brushing your teeth right after a meal can be one of the worst things you can do for your healthy teeth. A toothbrush can be considered an assault weapon against your smile if used immediately after eating certain foods. Enamel is like the tooth’s shield. It is a hard mineral exterior on each of your teeth. In reality, enamel is the hardest part of the human body—even stronger than bone! I like to regard it as a “super-structure.” But every superhero has a weakness, and enamel’s kryptonite is acid. A healthy tooth lives in a mouth that has a proper pH balance. When that balance tips from alkaline to acidic, a harmful process called demineralization begins. Demineralization occurs when acids attack and soften the tooth surface. Pores and fissures form and harmful bacteria move in. With each bite of food or drink, our mouth pH fluctuates. Highly acidic foods tip the balance of your mouth from a healthy alkaline to a dangerous acid. Here are some examples of those sources of acid: citrus fruits, soda, and sugary foods. There are certainly many others, but these are the most common. So how does brushing your teeth immediately after a meal make this process even worse? After eating highly acidic foods, your teeth are susceptible to damage. When you brush your teeth in this weakened state you are actually damaging your enamel. The abrasive bristles of the brush wear away the protective surface of the teeth. 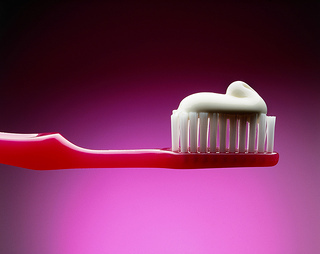 You should avoid brushing for at least an hour, or take other, simple preventive measures immediately following a meal. First, rinse with or drink clear water. Then chew some sugarless gum. Both of these practices will produce saliva, restore a healthy pH level in your mouth, and coat your teeth with nourishing minerals. Out of all the sugarless gums available, the best of the best are those that list xylitol as the first ingredient. Another option is to consume cheese, milk, or another non-acidic food or drink to conclude your meal. After you have given your mouth time to return to a healthy pH, feel free to brush your teeth. Just keep in mind that any time you eat acidic foods, you weaken your teeth. Make sure not to worsen the problem by brushing immediately after dining and damaging your teeth even more. Questions? Call us at Abari Orthodontics & Oral Surgery. Dr. Abari is the best orthodontist ever. My son, Michael, has the most beautiful teeth ever! — Denise F.
We mostly went to the San Dimas office but the staff is helpful at both locations. My son's teeth look great and we are looking forward to working again with them. Thank you Dr. Abari —Maya H.